The Classic Smile has loyal patients from all over the county and beyond, from Chelsea, Revere, Belmont, Everett, North Reading … the list goes on and on. There is a reason patients from all over drive to Medford for their dentistry needs. Each day, every member of our team strives to make each patient feel as if he or she is our only patient and to send the person home with a smile. We believe that a beautiful smile is the door that unlocks a person’s potential to relate positively to his or her surroundings. Since the investment in extensive dentistry (for those in dire need) is high, we must communicate our commitment to integrity, quality, and durability of craftsmanship to our patients. But we also seek their satisfaction in the aesthetics we have provided for them. We believe in respecting their time and ask the same of them. 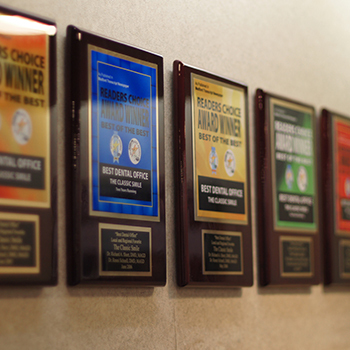 What makes The Classic Smile Medford’s favorite dentist? Periodontics is a specialty that involves preventing, treating, and diagnosing disorders of the gums, including gingivitis treatment, deep cleanings (scaling and root planing), flap surgery, and bone and tissue grafts. Prosthodontics is a specialty that entails restoring and replacing missing teeth using such prosthetics as dental implants, crowns, bridges, and full or partial dentures. Dr. Gonzalez is a board-certified periodontist, and Drs. Sharifi and Schnell are certified prosthodontists. To become a periodontist or prosthodontist, a dentist must complete three years of specialized study after earning the dental degree. Along with the general dental services of Dr. Short, our patients may enjoy continuity of care for all their oral health needs.